The trend today is to refer to marine algae used as food as "sea-vegetables". The main species used in Ireland at present are dulse, carrageen moss, and various kelps and wracks. Dulse - also known as Dillisk - is a red alga (Palmaria palmata) that is eaten on both sides of the North Atlantic. Generally only eaten in Ireland after it has been dried, it is frequently sold in small packets, most commonly in the west and north. It is also eaten in Canada, Iceland, Norway, France and Scotland. Carrageen Moss or Irish Moss (Chondrus crispus and Mastocarpus stellatus) is widely sold dried for cooking as as a remedy for colds and flu. 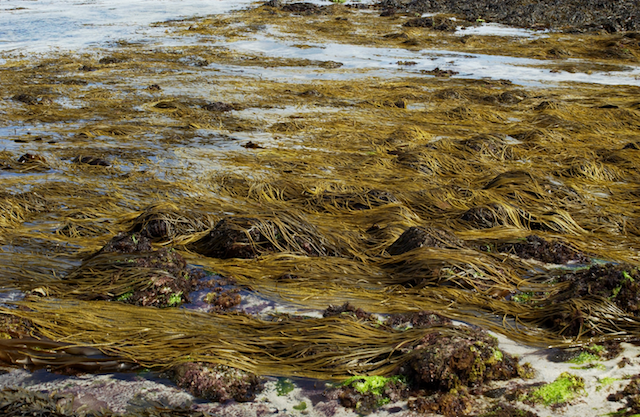 Whilst dulse and carrageen moss are worthy sea-vegetables with a history of utilisation and a small but proven market, other species also show considerable promise. Our kelp resources are considerably under-utilised. All of the Irish kelp species are edible but Saccharina latissima (formerly known as Laminaria saccharina) is probably the most palatable as it has a somewhat sweet taste, probably due to its high levels of mannitol, and it also cooks better. Two other brown algae with potential as food are becoming popular: Himanthalia elongata, known in some places as Thongweed as Ríseach in Irish, and Alaria esculenta, also known as Dabberlocks or Murlins. Himanthalia elongata is eaten in France after drying or pickling ("Spaghetti de mer"), and plants are sold in Ireland dried. After soaking in water it makes a surprisingly fine accompaniment to a mixed salad; it does not have the strong seaweedy taste that some dislike. Plants are easy to collect (see above for an extensive polulation on the coast of Co. Clare) but must be dried quickly and packaged well to preserve their excellent taste and mouth feel. Alaria esculenta is a large, kelp-like brown alga that grows on exposed shores. In Ireland, plants grow to considerable sizes, being found up to 6 m in length in some areas, but these are dwarfed by some Pacific species that may grow to 18 m in length and to 2 m in width. Nutritionally, sea-vegetables are as good as any land-vegetable and, in some cases, are superior in their vitamin, trace element and even protein content. Increasingly catholic food tastes in Europe should see enhanced utilisation of sea-vegetables in the next 20 years. Wild Irish Seaweed. Certified Organic Seaweeds hand harvested sustainably by the Talty Family off the coast of Co. Clare on the west coast of Ireland. Connemara Organic Seaweed Company provide hand harvested, sustainable, kelp and seaweed products for human consumption through health supplements and edible products. This is Seaweed. The finest organic seaweeds lovingly hand-harvested from the nutrient-rich Atlantic Irish shores. Emerald Isle Organic Irish Seaweed. A family business producing seaweed as supplements, cooking, gardening and bath products. Irish Seaweeds Ltd. 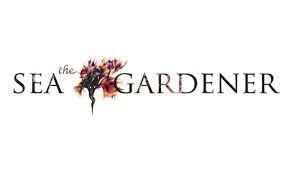 Suppliers of 100% natural hand-harvested seaweeds and edible sea vegetable products from Ireland. Seaweed courses, cookery courses, and much more in Co. Waterford. Site © M.D. Guiry 2000 - 2019. Important copyright notice: all text, design and photographs on this site are copyrighted by M.D. Guiry unless otherwise stated and all rights are strictly reserved. Click here for copyright information and contact. Website design: 249 Design Studio. Site maintained by M.D. Guiry (michael.guiry@nuigalway.ie). There have been 8724806 page loads since 1 January 2014 on 22 April 2019.